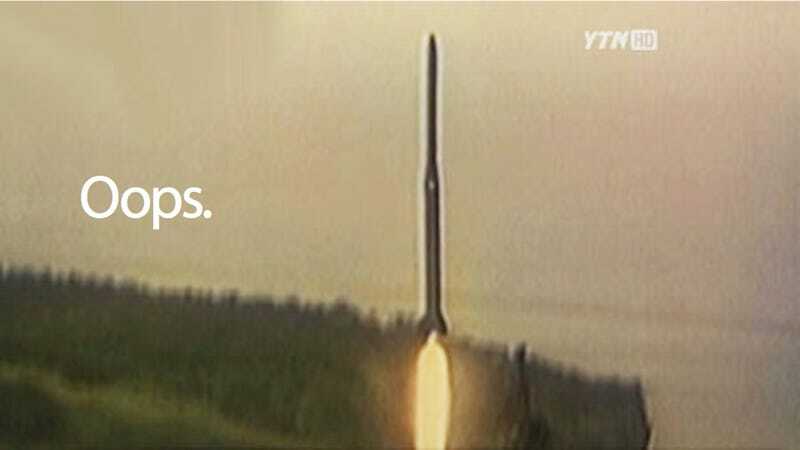 We knew it was coming, and here it is: Pyongyang just pulled the trigger and sent its Unha-3 rocket toward space, to the dismay of everyone who fears a North Korea who can strike the world. Update: Both the US and Japanese governments say the launch failed, with the Unha-3 rocket falling apart shortly after takeoff. Who would have guessed a country that can't afford tractors would fail to reach space? The launch was first announced by South Korea's YTN television network. The upper stage of the launcher is designed to carry a lightweight satellite-about 100kg-so it's not clear that structurally it could carry a 1-ton (1000kg) nuclear warhead. But if it could, we estimate this technology could theoretically launch a one-ton warhead to about 10,000-11,000 km ( 6500 miles). They could certainly launch a 1-ton warhead on the first two stages, and that would have a range of about 7.500 km (5000 miles). We have not seen North Korea flight test a heat shield for a long-range missile. Because the reentry heating increases with the square of the warhead's speed, the heating would be about 10 times worse for an ICBM than for North Korea's Nodong missile. Heat shield technology is well understood, but you would expect to see a flight test of it if North Korea wanted to have confidence that it could both launch a warhead and get it back to the ground. And now it's flying through the air. Update: NBC News reports the White House will issue a statement on the launch shortly. Update 2: The Aviationist's David Cenciotti points out that there's currently a Korean Airlines plane on the rocket's project flight path. Ruh roh. Update 3: ABC news reports the rocket launch has "failed," according to unnamed US officials. Update 4: The UN Security Council will convene Friday to discuss the rocket launch, which will in all likelihood be pointless because China is on said council. Update 5: CNN is reporting "the rocket got off the launch pad but broke apart in flight." Update 6: US officials are now saying the rocket broke up mid-launch as well. Update 7: ABC New says "U.S. officials said that the missile is believed to have crashed into the sea," citing a "larger than normal flare seen 90 seconds into flight." North Korea! We had such high hopes this time around. Update 8: The AP, also citing "US officials," is now saying the rocket may have failed. Update 9: Japan's defense minister now agrees the rocket broke up faster than 3LW. Update 10: CNN relays Japan's report that the rocket flew for "about a minute" before falling to pieces. Update 11: This image is currently being broadcast on North Korean state television, which is a pretty accurate representation of today's grand failure. Despite the failure of its attempted missile launch, North Korea's provocative action threatens regional security, violates international law and contravenes its own recent commitments. While this action is not surprising given North Korea's pattern of aggressive behavior, any missile activity by North Korea is of concern to the international community. The United States remains vigilant in the face of North Korean provocations, and is fully committed to the security our allies in the region. North Korea is, naturally, beyond humiliated, having proven just how astoundingly backwards and inept they are in virtually every realm of statehood. CNN reports a chair reserved for an official announcement in the carefully planned North Korean press room is simply sitting empty, with the dictatorship refusing to even acknowledge the embarrassment.